Go carve yourself a cyber-pumpkin. Our elder cat, Simon, has always been something of a chatty critter, eschewing the more traditional "meow" for a series of trills, chirps, and something that sounds like, "myap." He's almost impossible not to imitate when he gets going. So there was the spectacle of Simon trying to communicate something to us this morning and us trilling and chirping back at him: "mrrra, mya, mrrip..." Finally, Simon shut his mouth and cocked one ear back, in obvious disgust. I am positive that ear-cocked expression meant, "Geez - your accent is total crap." It's Been a While, So What Would You Expect? Yes, I have been remiss and absent of late, trying to make my schedule and my desire to blog a bit more compatible. So far, the results (at least blog-wise) have been "meh," but life-wise things are going pretty well. In the background, I have continued to harvest the delicious nutty flavors of crazy, silly, or otherwise questionable Google searches that have led various unsuspecting people to WoT? Volume 10 is here. long-necked people - Hey, it's possibly the only thing that dooce and I have in common. being the babe magnet - Perhaps I should have MacIntosh guest-blog that one to tell us all what the experience feels like. baked potato accessories - Wow. Unless you are Mrs. Potato-Head, do you really want to start thinking about handbags and earrings for the spudly set? rainly - There are pages and pages of results if you Google "rainly." Good grief! people are petty jerks - Yeah, well. Is this news, or just moaning? Writing dwarf - We don't have one of those here. The more I think of it, it sounds like some sort of offshore sweatshop. "We didn't have time to blog, so we offshored it to the writing dwarves. Blog posts come really cheap if you take them out of the country." Okay, now I need to shower. I've officially squicked myself. wot do tree eat - It’s times like this when I regret my acronym. BATMAN SYMBOLS - I never mess with the punctuation of my crazy WoT searches. Sometimes they create punchlines in and of themselves. pictures of being quiet - How can you tell? Okay, Universe. Time out. Stop picking on the small, defenseless, fuzzy ones. In the last week, my friend Lynda's dog Gulliver got out of the yard and was hit by a car and killed. My friend Melanie's sister's cat Pushkin had kidney failure and is no more. 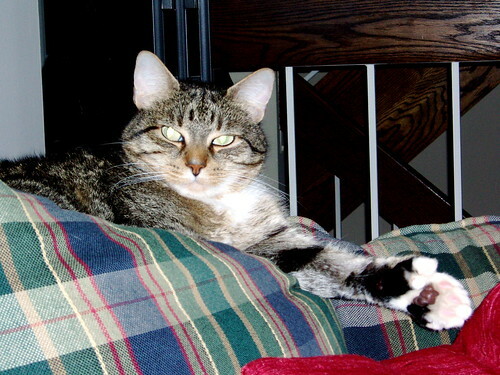 Over at Going Jesus, Sara's cat Clyde had to be put down due to feline diabetes. The latest is that my in-laws' dog Noelle was hit by a car and is severely injured. Pelvis broken in several places, punctured bladder, broken ribs. Possible nerve damage in at least one of her back legs. Excuse me - I need to go and hold all of my furry creatures very, very tightly for a while. "Did you just put on a Johnny Cash CD?" "Hm. I didn't think you liked Johnny Cash." "Why would you think I didn't like him?" "Well, you never said you did." "I don't think the subject of whether or not I liked Johnny Cash ever came up." "Well, I guess I figured if you had an opinion on the subject you would express it, regardless of whether it came up." "Huh. Well, I like Johnny Cash. I don't like Bruce Springsteen, though." The man does know me rather well. Seriously. It appears I have been linked to from a Polish Star Trek discussion Board. Given that they linked to a piece where I was "meh" at best about the women of Star Trek, what they have to say should be interesting. John does not remember his dreams. Me, my sleeping brain thinks it's François Truffaut one night and Wes Craven the next. I get fantastic landscapes, dizzying interiors, and then just for kicks I get horror. Note to the auteur in my head: I don't like horror. The past several nights have been particularly cinematic. I had one of my interior dreams (I get in a hotel elevator, a glass one, and the elevator goes up - then across the lobby, past a giant, glittering chandelier, and into an elevator bank on the other side of the lobby. Paging Willy Wonka...), I had one of a series of recurring semi-nightmares about driving a vehicle with no brakes (So. Not. Fun. ), and then a panicky nightmare with lots of running around, a stalker outside the house, and me frantically turning on all the lights. * Yes, I would love to talk about Serenity. But I'm not going to. I'm not going to spoil the unspoiled.